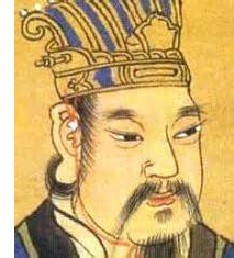 Sima Yan (236-290) - Military general who lived at the end of the Three Kingdoms Period and re-unified China under the Jin Dynasty which lasted from 265 to 420. The three kingdoms from which the era gets its name were: Wei, Shu and Wu. Sima Yan came from the state of Wei. He also came from a line of military leaders. His grandfather, Sima Yi, was a general who served under the state's founder, Cao Cao (See Yellow Turban Revolt). After Cao Cao's death, Sima Yi, remained a close confidante of his son, Cao Pi. He is most famous for defending the state of Wei against Zhuge Liang's own attempt to unify China. Zhuge Liang was from the state of Shu and launched a series of campaigns called the Northern Expeditions. Sima Yan's father, Sima Zhao, was also a general who did much of the conquering which paved the way for re-unification of China and opened the door for his son to usurp the throne of Wei and claim the title of emperor once the country was unified. And so with all the parts in place, Sima Yan ascended the throne in 265 and became Emperor Wu, reigning until his death in 290. He was considered generous, but also self-indulgent to the point of being wasteful, and ended up squandering his empire's resources which probably contributed to it's downfall sooner than necessary.